Drysdale, a rural town with an expanding urban area, is 55 km south-west of central Melbourne and 16 km east of Geelong. Its urban area merges with Clifton Springs. In 1848 Anne Drysdale (1792-1853) and her partner Caroline Newcomb (1812-74) acquired a farm north-west of the intersection of Jetty and Geelong-Portarlington Roads. 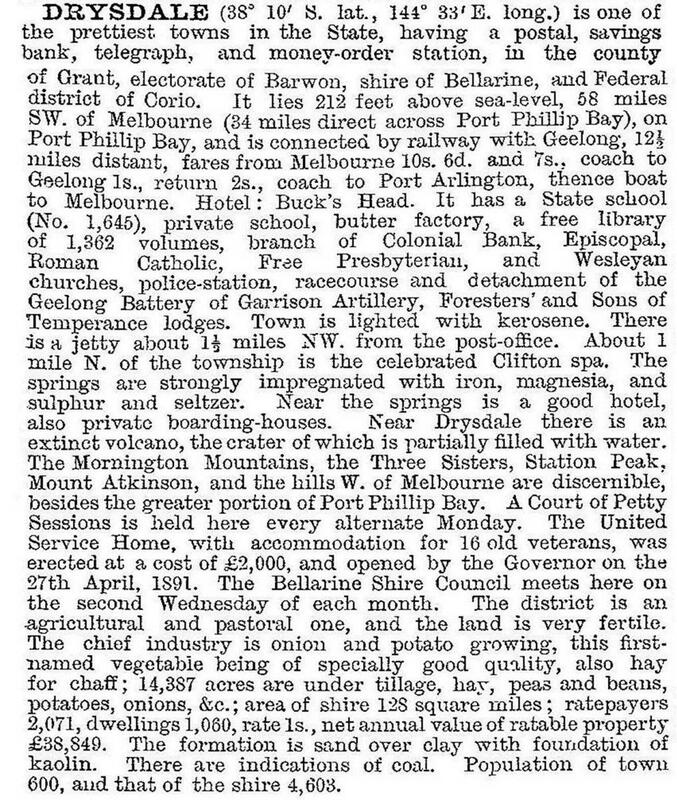 Drysdale had prior farming experience in Scotland and on a pastoral run east of Geelong. Drysdale and Newcomb were successful farmers and built the Coryule homestead. The heritage listed homestead is in McDermott Road, Curlewis, immediately west of Drysdale. Both women were religiously observant. Drysdale, a Presbyterian, was probably influential in having a Presbyterian school opened in 1849. Wesleyan-Methodist Newcomb was secretary of the Methodist church (1849). A Wesleyan church, known as the Tuckfield chapel, was built in Wyndham Street, near Ashworth Street Drysdale in 1850. At that time the district was known as Bellerean or Bellarine, then Tuckfield (c1854) and by the end of the decade, Drysdale. The town developed not around the churches but the Buck's Head hotel (1852) at the corner of Collins Street and the Drysdale-St Leonards Road. Anglican and Catholic schools opened in 1853-54 not far distant from the hotel. The land around Drysdale was fertile and the location was considered to be healthy. Settlement was relatively dense, and in 1853 a Road District was created for all the coastal area between Geelong and Portarlington. The Road Board's office (1856) was built in Drysdale. In 1872-73 a jetty was built on Corio Bay for taking produce from the Drysdale district. It enjoyed good patronage until the railway from Geelong to Queenscliff opened in 1879. By the 1870s most churches had replaced their chapels with larger buildings, a mechanics' institute (1868) had opened and a government school (1875) took over from the earlier denominational ones. Until the 1950s Drysdale was an agricultural township with amenities that included a bowling green, croquet lawn, churches and a shire hall. In 1957 there came a hint of an urban future when Willmore and Randell embarked on house estates and a golf course in neighbouring Clifton Springs. In 1954 an infant welfare centre opened in the RSL clubrooms (former Presbyterian church, 1852), and a permanent centre was built in 1970. Six years later a senior citizens' centre opened. The State primary school went through several enlargements (545 pupils, 2014). South of Drysdale there are Catholic primary and secondary schools (1997, 1999) and Bellarine State secondary college (1997). East of Drysdale there is the Bellarine Christian college (1996). Drysdale is on the busy Geelong-Portarlington Road, with traffic passing by the Drysdale (former Bucks Head) hotel. Shops cluster around the town centre, although an Aldi supermarket (2011) is to the east. There is a Sunday market on the reserve around McLeods wetland, just west of where the Indented Head Farmers' Association once had its showground. There are numerous heritage buildings, including the former shire office/court house in High Street. Beyond the old shire office there is the former Drysdale railway station at the junction of the Bellarine rail trail and the start of the tourist railway to Queenscliff.